The Elastic Stop Nut from Simmonds Aerocessories. Homepage. This page: A new take on automotive fasteners in the 1940s, courtesy of Simmonds Aerocessories. Simmonds Elastic Stop Nuts - where vibration is a "Snag". This leaflet was published in the late 1940s I believe, and explains the benefits to motorists of using the Simmonds Elastic Stop Nut in their motorcar(s). Two key areas in which it was suggested these nuts could prove useful, included on the engine mounting bolts, and also on the U-bolts used to secure a car's leaf springs. The idea was to use these in place of traditional nuts and bolts, wherever there was a risk of vibration loosening the fastenings. As well as on road cars, I believe that they were also used in motor racing, as I've an old trailer which, at one time, advertised these products on its side. They work in the same way that modern Nyloc nuts function, although the Elastic Stop Nut used a fibre rather than nylon insert to secure the fixing. The nut featured a raised top edge, in which the fibre collar was situated. As the nut was wound down onto the bolt, the fibre collar would lock itself into the bolt threads, locking it into position. This allowed the designer to avoid using either the spring washer, or the split pin, both of which were commonly found on cars of that era. 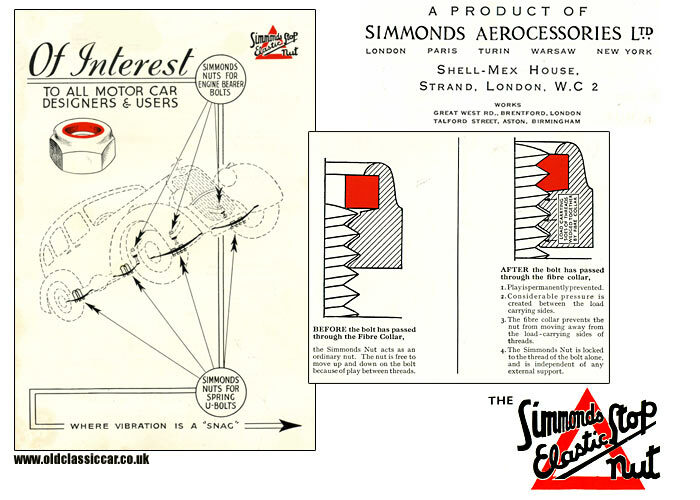 Whereas the use of zinc-plated Nyloc nuts on most old cars looks quite out of place, if anyone happens upon a genuine stash of these nuts from Simmonds Aerocessories, they can use them on their '40s or '50s car with a clear conscience - just look for the nuts that incorporate a red fibre collar! The head office address given was Shell-Mex House, Strand, London WC2, so whether Simmonds had a relationship with the Shell company, or simply used offices in their building, I'm not sure. They also had an address on the Great West Rd, Brentford in London. Happily the art-deco style building still survives, albeit as apartments rather than something genuinely useful. The firm was perhaps better known for supplying components to the aircraft industry throughout and following on from war. Oliver Simmonds, the firm's creator, had a background in aviation. In his earlier years he worked with the Royal Aircraft Factory, then went on to work with R.J. Mitchell at Supermarine, aiding the design of their seaplanes. In 1928 he left Supermarine, and set up two companies - Simmonds Aircraft Ltd and the Simmonds Interchangeable Wing Co.
By the late 1930s he was an MP in the British Parliament. Nevertheless his interest in aircraft components continued, and he set up Simmonds Aerocessories, concentrating on fuel system and aircraft control components. In 1948 he moved to the Bahamas, his business interests having already been sold on.